A girl’s relationship with her father is one of the most precious ones in her life and even when she grows up and moves on with her life she will always be a little princess in her daddy’s eyes. As with most other foods, even with this dish, balancing of flavors is very crucial. We can not let any ingredient over power the rest of them. The aubergines are either roasted directly over a gas flame or they are baked in an oven till soft. I personally prefer roasting them over a flame because it gives the signature smokiness to the dish. Place the aubergine directly over a medium gas flame. keep turning it occasionally till the skin gets evenly charred and crisp. remove from flame and let it cool. Slit it open vertically into two halves. Gently scoop out the flesh and place it in a bowl. Mash it with the back of a fork. Now add the rest of the ingredients and mix well. Adjust seasonings according to taste. Drizzle another tablespoon of olive oil before serving. You can sprinkle paprika or red chili powder if desired. 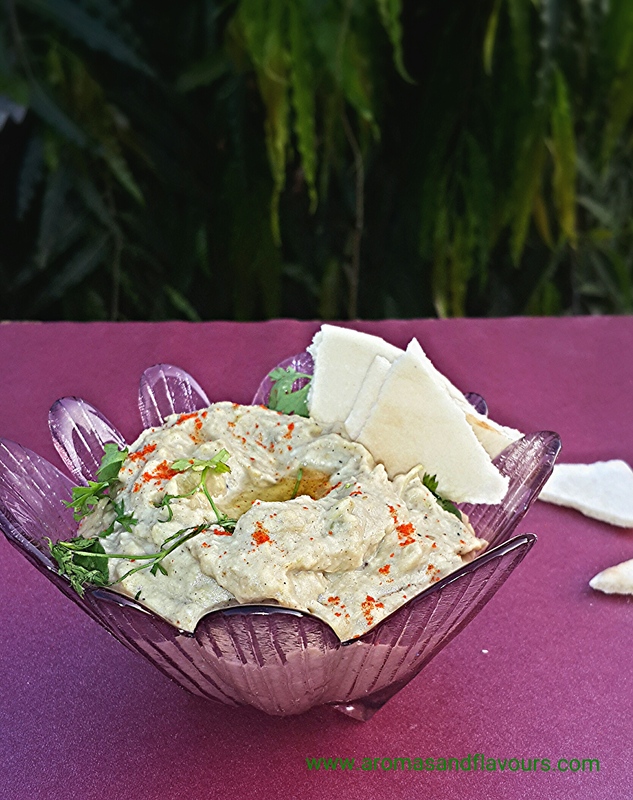 Serve with baked pita chips/pita / khoobz or any other flat bread. Use it as a sandwich or tortilla spread. Its versatility is what makes it so immensely popular. You can store it in a refrigerator in an air-tight container but remember to serve at room temperature. I love baba ganoush. Yours is beautiful. Thanks for the recipe. Beautiful post. I knew that father-daughter relationship is so important in girls formation that when she grows up she will go and find a man who treats her just as her father did and build a relationship with him. Yeah very true. Fathers play a major role in shaping a girls attitude towards men in general and their confidence. This dip looks delicious. 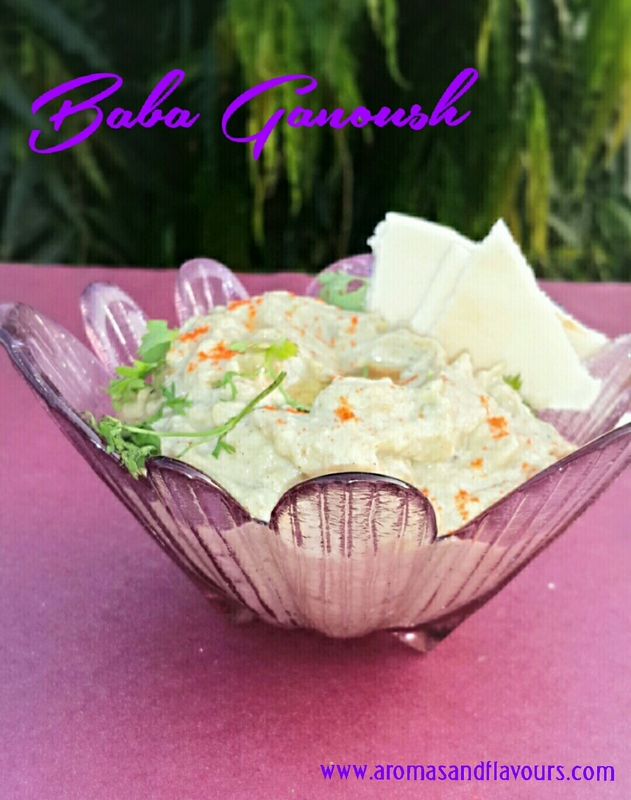 I’ve heard of Baba Ganoush before but didn’t know what it was so enjoyed the post! I’m addicted to baba ganoush 😀 It looks so tasty! Making this tonite as you have inspired me! Aww…thats so sweet of you. I will catch up with you soon. Wow!! look so good!!! Can’t wait to try this soon!! Thank you dear ☺ It is so easy to make. Looks awesome, I’m sure the taste is even better. Thank you . It really tastes awesome and very easy to make.